Driftwood Public Library in Lincoln City has selected Mr. Penumbra’s 24-hour Bookstore for their 2017 Everybody Reads event. They’ve invited me to give two lectures. This is going to be fun! On March 28th, I will be giving a lecture called “Computers and the Dawn of Modern Cryptography” at OMSI as part of their Science on Screen program. 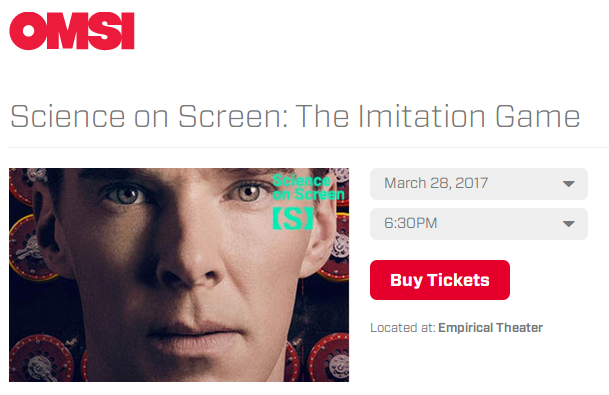 I’ll be speaking and answering questions just before a screening of The Imitation Game, starring Benedict Cumberbatch and Keira Knightley. I am really excited about this opportunity! Please come down to OMSI for an informative lecture and an excellent film. This past Fall, a bunch of big names removed StartCom from their trusted SSL Certificate Authority list. As a result, when I renewed my SSL certificates this year, I went with Let’s Encrypt. It was a pleasant experience, because Let’s Encrypt uses a command-line client called Certbot that does most of the heavy lifting for you. After certificate renewal, everything is still looking pretty good. Please let me know if you have any SSL problems with my website through the contact form. I renewed my SSL certificate today and updated the configuration. Still doing pretty well! OpenPGP Form Encryption for WordPress now supports Contact Form 7. You can download version 1.4.0 at the WordPress plugin site and start using a safer contact form on your website today! I am now working with my good friends at CommerceCollective! CommerceCollective is a web presence management company located here in Portland, Oregon, and they are great at SEO and social media stuff. They also are really talented web designers. If you’re looking for a full website solution, from design down to the nuts and bolts, we are the place to go. I’ll be supplementing their services with full-stack web development, IT consulting, and a little bit of copy writing. Read more about our team here! I’m in the middle of some major migrations and upgrades on the Arnesonium servers. So far, the results have been positive. For instance, the SSL/TLS configuration on my webserver is finally awesome. I’ve also got MaxCDN configured properly, so the entire website is now served via SSL/TLS only! Portland Underground Graduate School (PUGS) has invited me to teach a class on the history of cryptography starting May 4th. The class will be four sessions and is very affordable: only $40! We will cover the basics of cryptography, where it came from, and why it’s important. In addition, I will teach you how to use a number of manual cryptographic techniques. I’m really excited about this class, and I can’t wait to share my knowledge! To learn more and to sign up, please visit the PUGS class listing here. I’ve tagged version 1.0.4 of libbucket over on GitHub. You can download a tarball at this link. If you’d like to read more about libbucket, see my post from earlier this week. I never realized how much bucket clip-art existed.